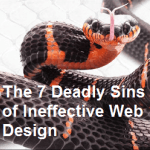 The 7 deadly sins of ineffective web design. The Internet is constantly evolving, which means that your web design and online marketing strategies must also evolve to keep pace with technological advancements. This is because Google Search Engine algorithm updates, and the wants and demands of the ever-increasing number of users turning to the Internet for a variety of activities. Whether you create a website that’s new or revamping an existing one, there are certain practices you should avoid. Some flaws in web design might not necessarily be fatal ones, but they can still have a negative impact on the public’s impression of your site or the way it gets evaluated and ranked for search engine placement. By avoiding the following “seven deadly sins” of web design, you can ensure that your site acquires a long shelf life in terms of remaining in the public eye where it can be visited, shared, and linked back to. The content in the titles, Meta tags, headings, and other page qualities include content that is visible to search engines and site visitors. Most importantly, aspects like titles and tags are used for page ranking purposes to determine if your page’s content is relevant to a user’s search terms. While there may be dozens of different social media sites your page’s content can be shared on, don’t include them all or the ones that are most likely to be used will get lost in the shuffle. Pick three or four and include those (Facebook, Twitter, LinkedIn, and Google+, for example). While videos and images and interactive components are entertaining, they are not always contextually relevant. If something isn’t specifically related to the purpose of your page content, leave it out. By distracting the visitor with gimmicky content, you are drawing their attention away from what you really want them to do – become part of your sales or marketing funnel. While some people don’t pay attention to this at all (and shame on them), other site visitors find spelling and grammar errors to be indicative of a company’s lack of professionalism and interpret it as meaning that the company cares about their customers about as much as they care about using proper English. Each landing page should focus on one idea and one goal – to convince the site visitor that they need to click, enroll, sign up, register, or otherwise take action to move them farther along toward becoming a customer instead of a window shopper. Don’t ask your site visitors what they want to do; tell them what you want them do, and make sure you do it clearly, visibly, and without ambiguity. You can’t make a site that appeals to 100% of the population, so choose your target audience and design your content with them in mind. Give them the information they want without making them hunt for it. Aside from these “sins” of web design, you should also consider using responsive design to ensure that your site is visible across all Internet-enabled mobile devices. Design your content with your visitors in mind and give them the superior experience they are seeking, and you’ll be rewarded with increased traffic, conversion rates, leads, and other benefits of a properly designed website. There are many things that will determine the difference between a successful, or a completely ineffective, web design. Even those following a generally successful web design business model still run into issues where they aren’t able to create a completely effective web design. By making sure to avoid these “7 deadly sins of ineffective web design,” you will be able to ensure a clean, successful web design every time.